At 76 minutes, Chasing Ice is a brief and focused documentary about the work of James Balog, the photographer who started the Extreme Ice Survey. Chasing Ice was a fitting closer at February’s Boulder International Film Festival since the film has Boulderites as subjects and filmmakers. If you missed it at BIFF, you can finally catch it in theaters. The film opens with talking heads on TV — including the founder of the Weather Channel — asserting that global warming is not real. Against that backdrop, Balog realized that computer models are not enough to convince people — including him, at the time — of the facts. What the world needed was some sort of photographic evidence, if there was any. “Ice is the visual evidence for global climate change,” he says. He shot photos of glaciers for National Geographic. He got the cover story, and it was one of the most widely read articles that year. It ended up being a scouting mission, he says. He would return to those glaciers and shoot them again to see if there were any visual changes. He was surprised to see just how dramatic the changes were, and from that surprise was born the Extreme Ice Survey (EIS). The EIS was planned as a project consisting of 25 remote cameras, photographing glaciers every day for 3 years. The movie delves into the technical problems of establishing the project. Balog had thought he’d be able to buy the necessary hardware, but instead he ended up having to engineer mounts, timers, and power supplies himself. A later complication is Balog’s knee. Installing and checking the EIS cameras requires hiking and climbing, and Balog’s knees, already damaged and operated on, get reinjured. There is an obvious punchline, a money shot, that the movie must be working toward: did Balog’s Ice Survey reveal any visual evidence for global climate change? Chasing Ice is pretty good at postponing the inevitable conclusion, and telling a good story in the process. Along with the difficulties in setting up the cameras, Chasing Ice also shows scenes of Balog and his assistants out on the ice, exploring weird and wonderful formations. They find small black wells bubbling with ancient gases. 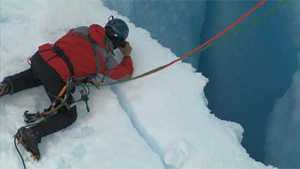 They climb around great crevasses and features called moulins. Moulins are where rivers of melted surface ice dive down to the bottom of the glacier. Their size and number probably count as evidence of global climate change, too, but Chasing Ice is more interested in the beautiful, architectural forms they make. The film does pay off in the end. The glacier calves an iceberg the size of Manhattan, and the EIS cameras record glaciers retreating more rapidly than anyone had predicted. Orange outlines overlaid on the first photographs in the sequences helpfully show just how far the glaciers have moved by the last photos. The rate of recession is alarming, but whether Chasing Ice will sway the obstinate minds of TV talking heads remains to be seen; I predict not. But why not see for yourself? That’s what James Balog did.